A web cam system at San Vicente Dam allows the public to witness progress on the world’s largest roller-compacted concrete dam raise. Two cameras offer different views of construction activities, enabling viewers to see months of dam raise work compressed into a brief time-lapse video. Click on Topside View or Downstream View for two vantage points of construction. These high-resolution photos were updated every 30 minutes, providing a current snapshot of dam raise construction. The time-lapse sequences combine these photos, illustrating the construction process. 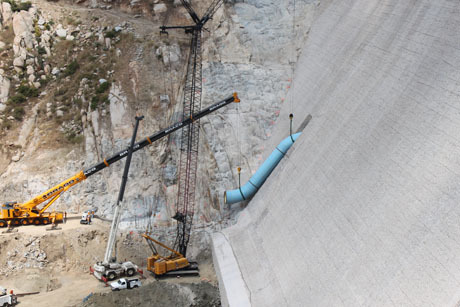 The San Vicente Dam Raise is part of the Emergency & Carryover Storage Project, a system of reservoirs, interconnected pipelines, and pumping stations designed to make water available to the San Diego region in the event of an interruption in imported water deliveries. San Vicente Dam originally stood at 220 feet and could store up to 90,000 acre-feet of water. The dam raise project increased the height of the dam by 117 feet – the tallest dam raise in the United States and the tallest of its type in the world. The raised dam will store up to an additional 152,000 acre-feet of water, more than doubling the capacity of the original reservoir. 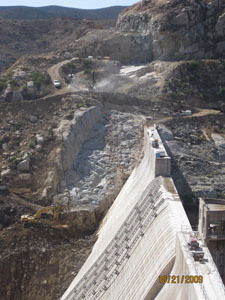 In June 2009, crews began the preparatory work to raise San Vicente Dam an additional 117 feet. The new dam reached its full height in late 2012, and new instrumentation and outlet facilities were completed in spring 2014. Further work to construct the new marina and to restore the site will continue through 2016. 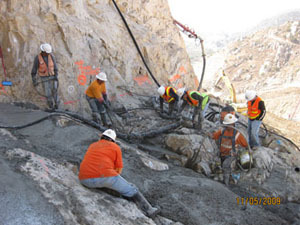 The design and construction of the dam raise has been closely monitored by the California Department of Water Resources, Division of Safety of Dams, to ensure the new dam is built to the highest safety standards. With questions regarding the reopening and recreation at San Vicente Reservoir, please contact Lori Felchlin at the City of San Diego by email at LFelchlin@sandiego.gov or call (619) 668-2072 or (619) 668-2050. 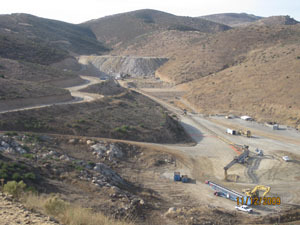 The following online photographic tour is provided to illustrate San Vicente Dam Raise construction activity. In 1943, the city of San Diego constructed the 220-foot-tall San Vicente Dam to store up to 90,000 acre-feet of water. The San Diego County Water Authority’s San Vicente Dam Raise project will increase the height of the dam by 117 feet, more than doubling the capacity of the reservoir. About two inches of concrete needed to be removed from the downstream face of the dam. To do this, rails were installed for hydrodemolition equipment to run on. In addition, workers excavated the hillsides around the dam to provide a solid foundation for the new concrete. The dam raise created the greatest single increase of water storage capacity in San Diego County history. It is the tallest dam raise in the United States and the tallest dam raise of its type in the world. In preparation for the new concrete to raise the dam, the contractor removed one to two feet from the top of the dam. This created a good bonding surface for the new concrete. In preparation for the new dam foundation, crews first excavated down to solid competent rock. Next, workers placed concrete into any crevices to level it out. This is called “dental concrete” because it is similar to a dentist filling a cavity. Here, representatives of the Division of Safety of Dams are monitoring the work. In some areas the contractor excavated deep into the adjoining hillside to reach competent rock for the new foundation. In these locations, the contractor built concrete shaping blocks to restore the contours of the excavated slopes. Crews used a road header, a drilling machine with a rotating head, to tunnel through 100 feet of concrete at the base of the dam. 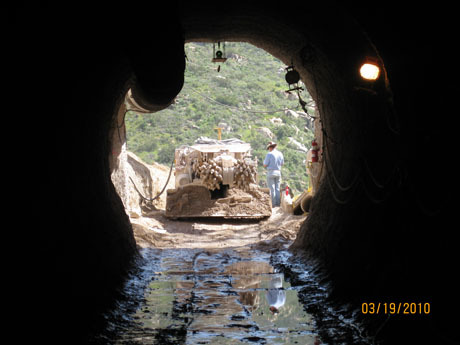 A new low-level outlet pipe was installed in a new tunnel through the dam. Its purpose will be to draw down the reservoir in the event of a dam safety emergency after the project is complete. As part of the San Vicente Dam Raise project, a new, smaller saddle dam must be constructed at a low point in the surrounding hills. This will enable the reservoir to reach its maximum water storage capacity. Here, the contractor is excavating the foundation for the saddle dam. The saddle dam crosses the original marina access road, seen in the center of this photograph. A new access road will be constructed to reach the new marina. It will be wider, less steep, and more truck- and trailer-friendly. The original marina facilities were demolished as part of the first phase of construction. This area will be under water once the reservoir is filled to the new water level. A new marina will be constructed near the large rock pile in the background of this picture, about 800 feet up the canyon from the former marina. The former marina parking area, visible in the foreground, has been demolished. A rock-crushing and conveyor system was set up near the old marina. It processed rock from nearby hillsides, as well as rock that had been stockpiled over the past few years from the Water Authority’s earlier projects at San Vicente. The crushed rock was delivered by conveyor system down to the old marina. An extensive aggregate mining and processing plant is now operational above the former marina. 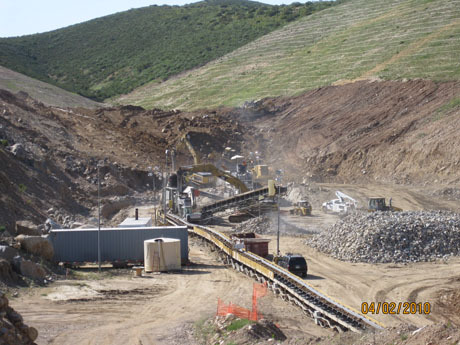 Roller-compacted concrete produced in the batch plant (center) will be delivered to the dam via a conveyor system. The city of San Diego significantly lowered the water level before construction began. The water taken out of the reservoir was used by the city’s customers. The “bathtub ring” above the shoreline reveals the previous water level. When the dam raise is complete and the reservoir is completely refilled, the surface area of the reservoir will increase by approximately 500 acres. The reservoir remains operational during dam raise construction. An aerial view of the project site shows the existing 220-foot-tall dam and recent excavation that extends uphill to the right of the dam. This excavation for the new foundation illustrates how high the dam will be once it is raised 117 feet. The raised dam will be 337 feet tall and will be made of roller-compacted concrete. This is a rendering of the completed dam, developed by the construction management team, Parsons/Black & Veatch Joint Venture. The dam will be stained to help it blend in with its surroundings. There are no additional Multimedia items for this project. The San Vicente area is rich in prehistoric and historic resources, and some of these will be inundated by the expanded reservoir. The interpretive panels below, describing past inhabitants of San Vicente, have been installed at the new San Vicente Reservoir Marina. Through these displays, the public has the opportunity to learn more about the cultural heritage of the San Vicente area. To learn more about the Water Authority’s work to document these historic and cultural sites for future posterity, click here to view the Public Interpretive Program. San Vicente Reservoir is owned and operated by the city of San Diego. To assure public safety during construction of the new marina and bypass pipeline, the reservoir remains closed to boating, fishing, and all other water recreation. The city of San Diego will reopen San Vicente Reservoir to recreation sometime between late 2015 and 2017, as soon as the water level reaches the boat launch ramp at the new marina. The amount of time needed to refill the reservoir will depend on water supply and demand. The new marina features an improved access road, an expanded boat ramp with six lanes, and a parking lot accommodating more than 300 vehicles. Additional shade trees and picnic areas at the marina will provide more options for recreational visitors to the reservoir. For information about recreational opportunities at other city reservoirs while San Vicente is closed, please visit the city of San Diego Lakes and Recreation web page at: www.sandiego.gov/water/recreation/index.shtml. Click here to view the environmental studies, which were completed in 2008. For more information about the dam raise project, please call the 24-hour toll-free project information line at (877) 682-9283, ext. 7001, or email espinfo@sdcwa.org. A representative from the project team will return your inquiry within one business day. With questions regarding the reopening and recreation at San Vicente, please contact Lori Felchlin at the City of San Diego by email at LFelchlin@sandiego.gov or by phone at (619) 668-2072 or (619) 668-2050.